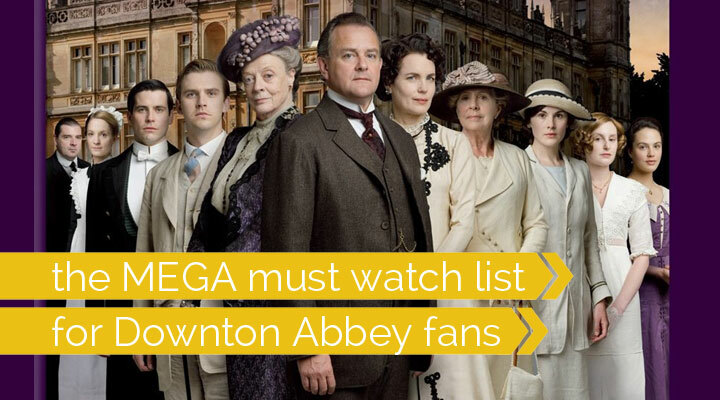 HUGE list of shows like Downton Abbey + seasons 1-4 giveaway! So, those lucky Brits get to watch the Season 5 premiere of Downton Abbey in less than a week! Can you believe it? Those of us across the pond have to wait four more months to check back in with the beloved characters in our favorite period drama. But I have good news: today you have a chance to win the first four seasons of Downton Abbey AND I have a huge new list of other great period pieces you can watch while you’re waiting for season 5 to arrive. This year I’ve compiled a MEGA list of 60 more period movies, miniseries, and TV shows you ought to watch if you love Downton Abbey – that’s right, 60! And be sure to scroll through to the end of this post if you want to win the first four seasons of Downton Abbey on DVD. A few notes before we begin: I haven’t watched every single one of these, so I cannot vouch for content. Also, all links are affiliate links to Amazon so you can see more info on each title, but there’s no need to purchase most of these (although they’ll make great gifts if there’s a Downton lover in your life!). You’ll find many at your local library. I’ve also noted which titles are available to view free at Amazon with a Prime Membership , and which are available from Netflix Instant Viewing (be aware availability may change). Also, if you know of another legitimate site to view a non-pirated version of one of these shows online, please let us know in the comments! Finally, if you (somehow) haven’t seen Downton Abbey yet, you can catch up with seasons 1-4 for free if you have Amazon Prime (just click that link to start on season 1) – or you can enter to win the whole set at the end of the post. An Ideal Husband : A wonderfully fun comedy of errors, this adaptation of Oscar Wilde’s play is witty and thoroughly enjoyable and has plenty of plot twists. Minnie Driver is fantastic here! Available on Netflix. Belle : This recent Hollywood release tells the fascinating true story of a young black woman growing up in aristocratic England before slavery is outlawed. Great romance and great history combined. Available to rent on Amazon. Berkeley Square : Three young women work as nannies in wealthy Berkeley Square in this fantastic miniseries; see my review here. Not available for free online viewing. Birdsong : A young soldier fights in the trenches in France and is haunted by memories of his past. (Note: one of the few Masterpiece Theatre productions rated TV-MA.) Available to watch free with Amazon prime. Bleak House : Adaptation of Charles Dickens’ classic novel. 2005 version available on both Amazon prime and Netflix. Bomb Girls : Set in the 1940s and tells the story of local women who work in a munitions factory building bombs for the war effort. Multiple seasons. Available to view on Netflix. Bramwell : A young woman in the late 1800’s is determined to work as a doctor in a man’s world. Quite a few seasons. Available on Netflix. Call the Midwife : Nurses in the East End of London serve as midwives during the 1950’s. Episodes available to purchase on Amazon, first two seasons available on Netflix. Daniel Deronda : Victorian melodrama based on George Eliot’s novel about a love triangle gone awry. Available on Netflix. Death Comes to Pemberley : Set 6 years after Lizzy and Darcy marry, this P&P “sequel” centers around a mysterious death committed on the grounds of Pemberly. Coming soon on Masterpiece Theater! Not available to order or view in the US until 10.28.14. Doc Martin: Set in the modern day, this TV series about a surgeon turned GP in a seaside town in Britain feels like a period piece due to the eccentric characters. Available on Netflix. The Duchess of Duke Street : This 1976 miniseries tells the rags to riches story of a scullery maid turned finest cook in London in Edwardian England. Available on Amazon Prime. Emma : A Jane Austen classic about a wealthy young woman you loves matchmaking. Both the 2009 Masterpiece miniseries and the 1996 movie are available on Amazon Prime, and both are worth watching. 1996 version also available on Netflix. Father Brown : A kindly priest catches criminals in 1920s England. Not available to view online as far as I know. Foyle’s War : A detective in the 1940’s works solving crimes on the home front instead of the battlefront. This successful series spans 8 seasons. First episode free on Amazon prime, 7 seasons available on Netflix. Gosford Park : A critically acclaimed 1930’s whodunnit (by the screenwriter of Downton Abbey) set at a lavish English estate. Rated R. Available to rent from Amazon. Great Expectations : An adaptation of Charles Dicken’s classic novel about Pip, Miss Havisham, and Estella. The PBS version is available on Amazon Prime, while the 2012 Hollywood version is available on Netflix. He Knew He Was Right : An idyllic romance turns sour due to all-encompassing jealousy in this adaptation of Anthony Trollope’s novel. Set in Victorian England. Available on Netflix. Her Majesty, Mrs Brown : A true life story about Queen Victoria and the servant with whom she develops a passionate friendship. Jane Eyre : This classic gothic novel has been adapted for screen more than a few times, but my very favorite version is the 2011 theatrical release – if you’ve watched an earlier version and didn’t fall in love, give this one a try! Available on Netflix (along with 3 other earlier versions). Land Girls : Set in England during WWII, this series chronicles the stories of 4 young women who leave their homes and go to work on a farm as part of the Women’s Land Army. Available on Netflix. Lark Rise to Candleford : Wonderful character-driven series set in rural England in the late 1800s. Available on Amazon Prime. Little Dorrit: Another Dickens adaptation, this miniseries centers around Amy Dorrit, a 21 year old seamstress who has spent most of her live in debtor’s prison with her father. Available on Amazon Prime. London Hospital : Set in 1906 London at a charity hospital, this multi-season mini series follows the ups and downs of the nurses as they care for a variety of patients. Available on Amazon Prime. Lorna Doone : An action packed adventure set in Old England, this is the tale of the banished Doone clan and John, the man who has sworn revenge on them, but is in love with with the daughter of the family. Lost in Austen : In this lighthearted take on Pride and Prejudice, a modern girls accidentally ends up switching places with Lizzy Bennet. Mansfield Park: One of Jane Austen’s lesser known novels is very loosely adapted in this Hollywood release. Available on Amazon Prime and on Netfix (along with the older BBC version). Merlin : This 5 season television series chronicles the adventures of a young Merlin who has to hide his magical powers from his master, Prince Arthur. The first season is a bit slow to start, but things go up from there, with dragons, knights, witches, romance, adventures, and more. Available on Netflix. Miss Fisher’s Murder Mysteries: Set in Australia in the roarin’ 20s, a glamorous and independent woman becomes a leading detective. Available on Netflix. Miss Pettigrew Lives for a Day : This is the absolutely charming tale of an unemployed governess who is swept into the glamorous world of high society by mistake. Set in London in the 1930s. Available on Netflix. Monarch of the Glen : A young London restauranteur is summer back to high ancestral home in the Scottish Highlands, where he must assume control of his eccentric family. Set in modern times. Available on Netflix. Mr. Selfridge : Fantastic 2-season miniseries chronicling the real-life Harry Selfridge, an American who opened one of Britain’s first department stores. Season 2 is even better than season 1. Available on Amazon Prime. Nicholas Nickleby : Nicholas Nickleby’s father has died and his family has fallen on hard times. It’s up to him to find a way to save them in this tale of intrigue, passion, and revenge by Dickens. Available to rent online from Amazon. North & South : My favorite! At the beginning of the industrial revolution, Margaret Hale and her family move from idyllic Southern England to a mill town in the north. Available on Amazon prime and Netflix. Northanger Abbey : An adaptation of Jane Austen’s least known novel, Northanger Abbey is Jane’s gentle parody of gothic fiction, complete with a heroine who’s imagine runs away from her regularly. Look for the Masterpiece Theatre version released in 2007. Our Mutual Friend : Another adaptation of Dickens. This book is considered his darkest and most romantic, and tells the tale of two sweeping love affairs. Available to rent from Amazon. Persuasion : Another personal favorite. While less well-known than Pride & Prejudice, Persuasion is generally considered to be Jane Austen’s most accomplished work. I prefer the 1995 Hollywood version, but the 2008 Masterpiece miniseries is also very well done. Pride & Prejudice : The gold standard of period pieces, nothing other than Downton Abbey has come close to P&P in popularity. Wonderful adaptation of Jane Austen’s most famous novel. P&P purists recommend the 1995 miniseries featuring Jennifer Ehle, which is available on Amazon prime, but the 2005 Keira Knightly version is also worth watching. Robin Hood : BBC’s three season series is a fun, (mostly) family friendly take on the classic story, with plenty of adventure and some bad guys you’ll love to hate (hello Guy of Gisborne). The first few episodes are a little slow, but things pick up quickly throughout the rest of season 1 and 2. Available on both Amazon Prime and Netflix. Sense And Sensibility : Jane Austen’s second most well-known novel about two sisters and their romantic trials has two great adaptions. The 1995 version with Emma Thompson is most well known, and is available on Netflix. The 2008 Masterpiece version is also wonderful. Sherlock : Perhaps not technically a “period piece,” this modern day retelling of the Sherlock Holmes story from the BBC is pretty fantastic. Occasional adult content (specifically in “The Woman” in season 2). Available on Netflix. Tess of the D’urbervilles : Thomas Hardy’s tragic Victorian novel is brought to life nicely in the 2008 BBC version, which is available on Amazon Prime. The Bletchley Circle : Four British women who worked together breaking enemy codes during WWII reunite a few years after the war and begin solving crimes together. Great story, but there are some brief yet very disturbing scenes related to the crime in season 1 (haven’t seen season 2 as a result). Available on Netflix. The Buccaneers : Four American heiresses take London by storm in this adaptation of Edith Wharton’s novel. They each make brilliant matches and seem set for a lifetime of happiness…until they realize a “good” marriage isn’t the end of the story. Available on Netflix. The Forsyte Saga : Follows the wealthy Forsyte family through it’s ups and downs, intrigues and romances, at the turn of the century (early 1900s). A bit of a soap opera, but enjoyable nonetheless (some PG-13 content). Available on Netflix. The Grand : In the most opulent hotel in Manchester England in the 1920’s, there is plenty of luxury, elegance, greed, suspense, and scandal. Available on Netflix (first episode also available free on Amazon). The House of Eliott : Two sisters born into privilege in 1920’s London must make their own way in the world after their father dies and leaves them penniless. They struggle to the top of the fashion world, opening their own house of haute couture. Murdoch Mysteries : Sophisticated detective William Murdoch investigates murders in the 1890s. Kind of like an old-fashioned CSI. First episode available to watch free on Amazon, others available to rent. The Mystery of Edwin Drood : An adaptation of Charles Dickens’ unfinished novel, this novel follows Jasper, who has met the woman of his dreams. Unfortunately, she is engaged to his nephew. What follows is a tale of suspense, intrigue, and mystery. Available on Amazon Prime. The Paradise : Lovely tale of a poor young shopgirl who travels to London to seek her fortune. She ends up working in the opulent department store – The Paradise – and meets a delightful cast of characters, including the mysterious store owner. Available on Netflix. The Scarlet Pimpernel : Set during the French Revolution, this is the story of a dashing English gentleman who swoops into France to rescue doomed nobles, and a beautiful young Frenchwoman who tries to determine his identity. Great show! My personal favorite is the 1988 Hollywood version with Anthony Andrews and Jane Seymour, but the more recent BBC version is wonderful as well! See my full review here. BBC version available on Netflix. The Secret Life of Mrs. Beeton : This show tells the story of the real life Mrs. Beeton, author of an 1861 guide to running a household (i.e. the very first lifestyle magazine). The Way We Live Now : This satire of Victorian society follows the rise and fall of an Austrian jewish financier who tries to become an English gentleman, and his daughter, who is courted for her fortune. Available on Netflix. Under the Greenwood Tree : A young woman from a wealthy family comes to a small village as the new school teacher and is pursued by three very different men. Charming story of rural English life. Upstairs Downstairs : This remake of the BBC classic is set just in swanky London just before the second world war. Available on Amazon Prime. The original TV series is available on Netflix. When Calls the Heart : Based on the book series by Janette Oke, this movie tells the story of Elizabeth Thatcher, as teacher who receives her first post in the Western Canadian frontier. Plenty of sequels! Wives and Daughters : Another Elizabeth Gaskell adaptation, this miniseries follows Molly Gibson, the only daughter of a country doctor, who decides to marry again, bringing both a step other and a step sister into Molly’s home. Available on both Amazon Prime and Netflix. Wuthering Heights : Emily Bronte’s haunting novel has been made into movies perhaps a dozen times, but my favorite version is the 2009 Masterpiece Theater edition, which does a fantastic job bringing the tragic love triangle to life. Available on Amazon Prime. Did I miss any you love? Let us all know about them in the comments! Great list, there are a couple here I will try to find right away. I’ve enjoyed most of your list in the past and am just finishing North and South again. My daughter is overseas currently and will see Downton Abbey, I am so jealous. great list! I have seen a lot of these titles on your list, but I’m so glad to know that there are others who enjoy this type shows just as I do. I am behind watching Downton Abbey series, right now I’m only on the third season. So since there is a lag time between when it is released in England and here maybe I’ll watch the remaining episodes a little slower……..Nah! lol I’m watching them on Netflix and I have to get the DVD’s to watch the show. There are typically 3 sometimes 4 episodes per DVD and then i have to send it off and wait for the another DVD to arrive, and not very patiently I might add. Winning these DVD series would be awesome! I plan on watching them again when I finish all the episodes I haven’t seen. Sounds redundant, but you catch little subtleties the second time that you failed to see the first time! The Doc Martin series is hilarious– I love how everyone in the town knows what is going on in his life before he does. Two of my favorite movies Oscar WIlde’s Importance of Being Earnest. The movie was done 2002 with Judi Dench, Colin Firth, Rupert Everett, Reese Witherspoon and quite a few others you’ll recognize. Another comedy movie period piece (US prohibition). The cast is perfect Sylvester Stallone (who is unbelievably good) Ornella Muti, Don Ameche, Kirk Douglas (cameo) Peter Riegert, Tim Curry, Vincent Spano, Marisa Tomei (fabulous), Linda Gray, Yvonne De Carlo, Harry Shearer and so, so, so many more. You should try Jeeves and Wooster–a hilarious series based on the stories by P.G. Wodehouse. I think you can see it on Hulu. LOVE Jeeves and Wooster! It’s what my childhood nostalgia is made of! There’s a Father Brown movie called “The Detective” starring Alec Guinness that I think you can watch on YouTube. I’m going to try it, anyways; I only thought the Kenneth More show was so-so. you missed one of the best ever…The Cazalets. Also I just finished reading The Bolter. I’ve watched Call the Midwife and The Paradise. Loved both of those shows. Never seen Downton Abbey, although I have heard lots of great reviews of it. Thanks for the list of shows to get hooked on, umm I mean to watch. Love your list. North and South is my favourite too. Makes my heart thump like mad at the station scene. Best kiss in film! thanks for the list! what about Keeping up Appearances?? another awesome british comedy that you can watch on netfilx. I watched Episode 1 of Season 5 last night on primewire.ag. And I live state side. http://www.free-tv-video-online.me/ is another site that posts after the British airings. 😉 Just so you know you don’t have to wait until Jan. Wonderful list! Many I’ve seen and some I’m anxious to see! I would also add to the list: Howard’s End, Enchanted April, A Room With a View, and (though not quite a “period piece” but oh, so charming) Local Hero. I’m sure I’ve forgotten one or two but I’m sure others will fill in the list nicely! Now off for tea and a good movie! Midsomer Murders is very good. It’s geared more to adults. Mrs. Bradley Murders is another good movie. Classic and modern Doctor Who is family friendly. Torchwood is geared for adults. An excellent series done by BBC is William and Mary. It stars Martin Clune from Doc Martin. In this series he is a delightful and caring person. I personally like William and Mary more than Doc Martin. It’s a must-see. Thanks for all the new selections, Autumn! I’m copying all of the titles so I can’t forget them! A Room with a View (1985) is a must watch if you love period pieces! A movie, not a mini-series, but it is a jewel, This story revolves around Lucy Honeychurch, a young Englishwoman, who makes her first visit to Florence, Italy in the early 1900’s. The excellent cast includes such venerable actors as Maggie Smith, Helena Bonham Carter, Daniel Day-Lewis, Judi Dench and Denholm Elliott. A delightful comedy of manners with beautiful cinematography, gorgeous locations , costumes, and detailed period production design, Thank you for this listing of other period films I know I will enjoy. I am looking forward to watching each and every one of them. another good movie is “my boy jack”. It is about rudyard kipling’s son set in WW1, I believe. that is a good one – a bit of a tearjerker, though, as I recall! The Call of the Midwife is another good one. Really good!!!! For me, this is a great list of shows to avoid. But there are a couple of good ones despite Downton Abbey not being ‘my cup of tea’. Foyle’s War is excellent police drama. The standout is Gosford Park. It should not at all be confused with “a 1930’s whodunnit”, instead it is a bitingly witty parody of an English upper-class murder mystery in the Agatha Christie style. Not sure if it’s considered a period piece, by my entire family absolutely loved the All Creatures Great and Small series. Maybe growing up on a small farm endeared it to us. Love the cast of characters in this series. Thanks for the suggestions – the ones I have seen from the list are all favorites, so I’m sure I’ll find some new favorites here! One of my very favorites that I didn’t see on the list is Our Mutual Friend – my absolute favorite Dickens! Oh silly me – it’s there after all! Gran Hotel. Available on Netflix! When Calls the Heart has also been made into a series on the Hallmark Channel! The first season was last year (2014) and was SO good! How disappointing! All the notes I made were current at the post publication time – it’s a shame if Amazon has removed some of them from the free with Prime list! I agree, My Boy Jack (Daniel Radcliffe) is a wonderful movie. Now, April 2015, I would the fabulous BBC series Poldark! I’m in love with it! Love doc Martin, Poldark, call the midwife, I really like British anything. Series: Poldark, both the current series and the 1975 series. Outlander. Mad Men. There’s also a VERY early Colin Firth movie called A Month In the Country. It’s set just after WWI. It’s difficult to find, but if you do, I don’t think you’ll be disappointed. I wish would take the contest down. Or edit the page to say it is over. WE WILL HAVE TO CHECK OUT THESE OTHER MOVIES, HAVEN’T HEARD OF MANY OF THEM. TY FOR THE INFO! WERE BORING FOR ME… I WILL MISS MR. SELFRIDGE THO, WE ORDERED THE DVD’S. THE CAST WAS WONDERFUL, AND NEVER BORING, AND MANY NICE LOOKING PEOPLE… SAD THAT THIS IS THE LAST SEASON!!! I WILL MISS THEM! WE WATCH MIDSUMMER MURDER NOW. TIRED OF AMERICAN TV! If you are still updating the list, Please add Poldark! to the list!